A combination of a beautiful walk and the visit of the famous archaeological complex of Machu Picchu. From Cusco, transfer to Maras. We start walking in the little town of Maras, which has nice colonial doors in its main street. In nearby Moray you find ¨the Inca lavatory¨. The circles were used for the development of different strains of crops. Between the highest and lowest terraces there is a difference of up to 15 degrees. Although the difference between neighboring terraces is very small, it is great enough to create distinct microclimates that change growing conditions and allow the propagation of a huge variety of plants each with slightly different growth requirements. After this very atmospheric place we walk down to the saltpans of Salineras. Here more than 5000 terraces are still in production and many families of Maras bring their salt to the market of Urubamba on mules. A short but rather steep walk brings you to Tarabamba in the Sacred Valley where we take a car to Ollantaytambo train station. In Ollantaytambo we take the afternoon train to Aguas Calientes. 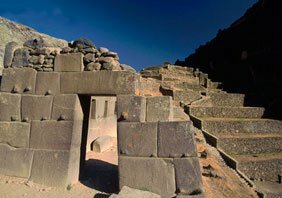 We take an early bus to the entrance of Machu Picchu and have a guided tour in this major Inca-site and then have free time to explore the ruins yourself. In the afternoon, return train to Cusco.